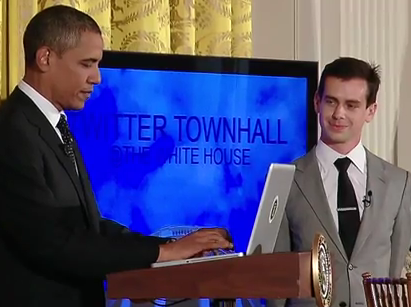 Did you watch the first Twitter Town Hall? I had it on my calendar but I was in a meeting with my new boss and co-workers. President Obama @BarackObama fielded a lot of questions about jobs and I for one am very very happy to get the opportunity to work again in an industry I so enjoy. With that said, I wish I had been able to send in a question or two via Twitter to our President and ask a question about healthcare and the current state of the economy. Many questions were asked on this subject and for the first time we got to see the actually Tweet and the President answering that question live. Biz was very quick to break the ice with President Obama and the audience when he made a slight joke reminding the President that he only had 140 characters while he was typing his first live Tweet on camera to his almost 9 million followers. I am so very impressed with both Twitter and the President for doing this that I am going to step up my blogging efforts here on Twarketing. I believe Twitter has not even scratched the surface of what they are ultimately capable of doing with this new form of communication to the masses. Take a look at the Twitter Town Hall and give me some of your feed back in the comments below.